Deaf dog: Scout is a 2 year old Dalmatian. "I rescued Scout from a local shelter. She is a wonderful dog; very funny, intelligent, and very sweet. I have found that there are hardly any drawbacks about owning a deaf dog,(besides that pesky attention-getting thing)and some advantages. They never bark at noises and we all sleep very soundly!" Other pets: Priscilla, DLH cat who is not too thrilled about sharing the sofa. Deaf dog: Kodi is a 2 year old Dalmatian. "We didn't know Kodi was deaf when we adopted him from the local shelter a year and a half ago. He does very well with hand commands and has also learned how to read our emotions." 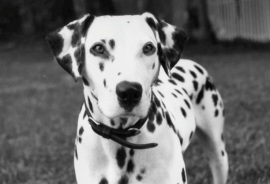 Other pets: Daisy, a 1 year old female dalmatian; cats, Boober and Herbie. Deaf dog: Dottie's human pal writes: I adopted her from the Humane Society. I did not want her put to sleep just for being deaf. She is a beautiful, sweet and intelligent dog. I have several friends who are deaf. I can sign, that is another reason I decided to adopt her. She is still a baby, but is learning fast. My other dog, a hearing Border collie named Honey, fell in love with Dottie on sight. Dottie also adores her. My two daughters are quite devoted to her too. Other pets: Border collie, Honey and six cats: Tazzie, Tory, Megan, Charlie, Socrates, and Tiger. Deaf dog: Jazz is a Mini Aussie Shepherd. Her human pal writes: "I bought the pup from a breeder in MN who claimed the pup was in great health. Jazz's personality is great and she's very smart. I'm going to try to give her the best home I can so she can live a dogs life but wouldn't give the sweet thing up for anything!" 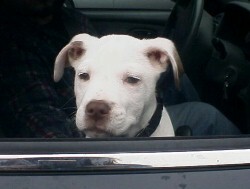 Deaf dogs: Powder and Annabelle's human pal writes:"Powder has learned to trust people & is very loving and mischeiveous. He has grown into a BIG boy that is very smart and makes us proud every day! Annabelle was abused, yet she is just as loving & outgoing as you get. She gets along w/ everyone & she is the perfect companion for Powder's rambunctiousness"
Deaf dog: Fuji is a Pit Bull/Dogo Argentino mix. Fuji's human pal writes: "We got Fuji from the animal shelter in January 2004. We didn't realize he was deaf until a week later. Although the training has been challenging, I truly believe that Fuji was meant to be part of our family." 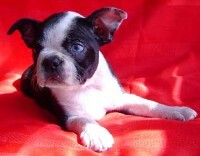 Deaf dog: Olive Oyl is a 15 week old Boston Terrier. Her human pal writes: "I have been wanting a Boston Terrier for a long time and was hoping to rescue one who really needed a home. Well, miracles happen and I adopted not one, but two BTs. Popeye is hearing and Olive was born deaf. We're just beginning our journey and appreciate reading about others' experiences." Deaf dog: Jack's human pal writes: "I just rescued Jack from an organization that keeps them so they will not be destroyed. I did not know Jack was deaf when I brought him home but figured it out the very next morning. This little stinker has captured my heart and I have big plans for him! More about that later. Oh, Jack has no idea he is deaf!"